It is with such great sadness to tell you that my dear cousin and friend John Daniel Windhausen passed away on June 23, 2006 after a courageous battle with cancer. Here it is two years later and reunion time soon. I think of you so often. I miss you! I miss you Dan so much. You have a special place in my heart. Thank you for all of the wonderful times we have shared and thank you for all the support you always gave me. that blow, I am the diamond glint on snow. flight. I am the soft starlight at night. Do not stand at my grave and cry, I am not there. 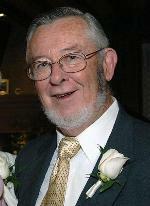 John D. Windhausen, 73, of Goffstown, died June 23, 2006, at Hillsborough County Nursing Home. He was born in Syracuse NY, on December 19, 1932, and was the son of Charles and Catherine(Furlong) Windhausen. He had been a professor of History at St. Anselm College for over 40 years. Professor Windhausen was one of the leading Russian and European scholars in the country. He published over 60 scholarly books, academic articles, conference papers and book reviews on Russian and Soviet history and sports. He helped make the History Department one of the strongest academic programs in the region and assisted in developing the highly-regarded Humanities program. He Chaired the History Department for 3 years, was a founding Member and President of the faculty Senate, and was awarded the annual "Excellence in Teaching" award in 1973. He led annual student tours to the Soviet Union and frequently brought messages and gifts between family members living in the U.S. and Russia. He served as trustee of the Manchester Institute of Arts and Sciences, and Chaired the committee that helped renew the St. A's football program. Family members include his wife of 49 years, Janet(Flewelling)Windhausen, of Goffstown; 2 daughters Brenda A. Windhausen, Lisa J. Windhausen, both of VT; 3 sons, John D. Windhausen Jr., of MD, Charles A. Windhausen, of Hooksett, Thomas W. Windhausen, of ME; 7 grandchildren; several nieces, nephews and cousins. Calling hours will be Monday, from 2 to 4 and 7 to 9pm in Lambert Funeral Home and Crematory, 1799 Elm St, corner of North. A Mass of Christian Burial will be celebrated Tuesday at 11:00 in the Abbey Church of St. Anselm College, 100 St. Anselm Dr. Manchester. Burial will follow in St. Joseph Cemetery, Donald St. Manchester.